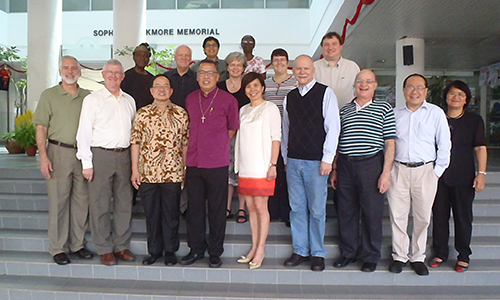 BISHOP Dr Robert Solomon has spoken at length of the paramount importance of our connection with God, our connection with one another, and our connection with a needy world. 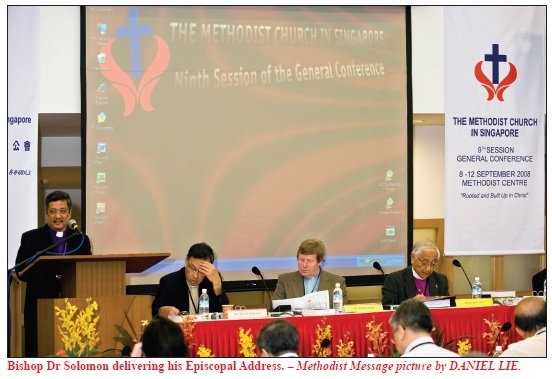 In his Episcopal Address on the opening day of the 9th Session of the General Conference of The Methodist Church in Singapore on Sept 8 at the Methodist Centre, he said that conferencing is an old Christian habit – and a good one, if done with the right expectations, and in the right Presence, and with the right intentions. He said: “John Wesley considered conferencing as a key means of grace that helps us to experience true Christian community and keeps us in the life and mission of the Triune God. The 9th Session, from Sept 8 to 13, will continue in Dec 4 and 5. The Bishop said the late historian Jaroslav Pelikan talked about how traditionalism is the dead faith of the living, as contrasted against true biblical Tradition, which is the living faith of the dead. It is possible for a great movement to become nothing more than a well-oiled institution, leaving a nice and respectable form without the living spark that once burst into glorious flames in its history. It is therefore no surprise that Paul later wrote of how there is always a danger that if we do not guard our lives and doctrines (1 Tim. 4:16 – “Watch your life and doctrine closely”), we may end up with a form of godliness but with its power drained out of it (2 Tim. 3:5). What is left is an organisation without the life of God. It is for this reason that we must ensure that at the heart of conferencing lies our seeking to connect with God. The General Conference (GC) is the highest body of our church and it may be assumed, even without our realising it, that the actual connection with God and His people is best done at congregational level in our worship services in our local churches. After all, the GC is more for legislation and taking care of key administrative details. But it would be a great fallacy to think like that. For precisely because GC is what it is that we should urgently and resolutely seek to connect with God. For how can we hope to legislate without knowing the Law-Maker and His purposes? How can we make decisions without spiritual discernment? And how can we make plans without meaningful prayer? How can we succeed without offering ourselves as living sacrifices? 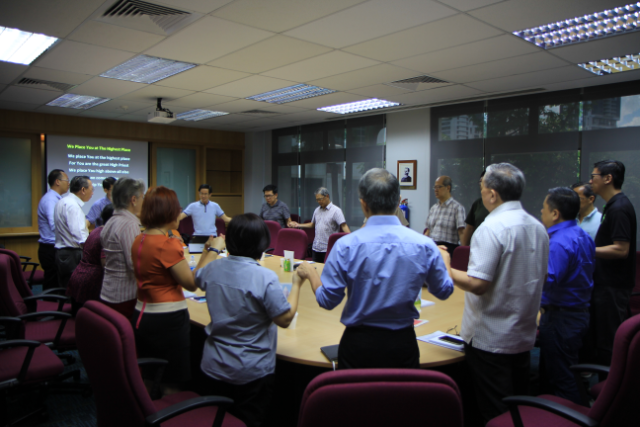 How can we hope to work without first worshipping? Organising ourselves is important but never as important as thirsting after God and His righteousness. We can spend time decorating our organisational vehicle that is going somewhere and making decisions on who sits where, but it is more important to consider the direction of our journey and of its nature. As the people called Methodists, we must continue to aspire to be well-connected with God. The strength of our church surely lies not so much in how wealthy or well-organised we are but in the quality of our spiritual lives as individual followers of Jesus Christ, and as families and local congregations seeking to let the life of Christ flow in and through us. Our inner lives are of utmost importance and we cannot afford the superficiality that characterises many churches in global Christianity. What we do in the pulpit and pew, around the Lord’s table, in our small groups, Bible studies, prayer meetings and conferences must all reflect our desire to draw closer to the Lord, and to seek to be well-connected with Him. The Bishop said that for a long time, we have had a fairly strong connection and we have benefited very much from this. However, we have also faced many challenges to the connection and this has come in many ways. Our current challenges lie in at least two directions. Firstly, we are becoming increasingly embedded in a postmodern environment in thought, fashion and practice. One important concept in this new worldview is networking, as opposed to older more structural and organisational ideas. Our historical Wesleyan understanding of connectionalism has been more in terms of structure and organisation as seen in our conferencing and episcopal systems. Herewith we see the tensions that are developing, that require serious thinking, discussion and reflection on our part. Another issue that we need to be aware of in terms of its negative effect on our connectional relationships is the increasing wealth and other resources among our various units. It appears that increasing wealth has a tendency of promoting a more independent mindset that loosens and disrupts our connections at all levels. The apostle Paul had warned long ago about this when he wrote of the Body of Christ and the real problems that it faces: “The eye cannot say to the hand, I don’t need you. And the head cannot say to the feet, I don’t need you.” (1 Cor. 12:21). Whether our connections are weakening or not is left for each of us to observe, discern and note. But there are many who are quite sure that the connection is weakening. This has been the observation of some of our entities such as MWS, our schools and others. 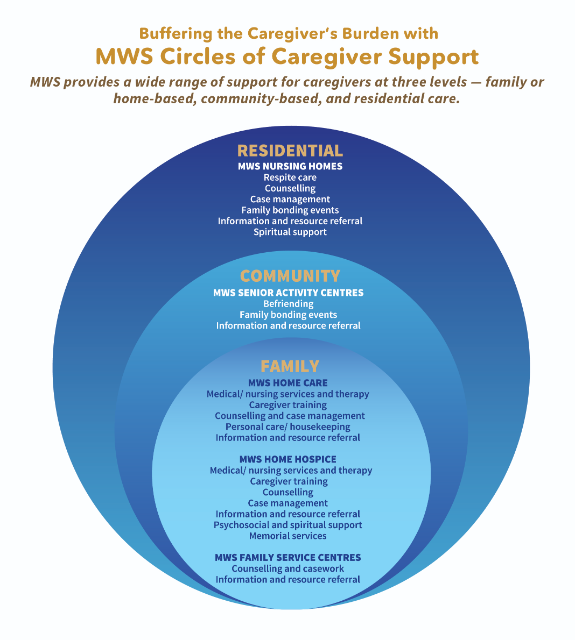 They have found it a challenge to get our various units to respond in a concerted and strongly connectional way to the various needs and challenges they are facing. We still have fairly strong expressions of our connectional nature, such as our itinerant system for our pastors, and the way all our properties are collectively and centrally held in trust. In some of these areas, our connectionalism has been maintained or strengthened. But in other areas, we would have to work at it so that in our doctrines, liturgy and order, there is an adequate expression of our connectional structure, not only on paper but in actual practice. On Our Connection with a Needy World, the Bishop said that when we strengthen our connection with our Triune God, we begin to recognise the importance of the connection within ourselves. As we draw into God, we also begin to be drawn into the missio dei or the mission of God. We cannot be truly connected with God and with one another if we are also not connected with the lost, hurting and needy world in which we live, and for which God has compassion and mercy. There are many needs in our world today. Some of the problems are worsening, while new ones are developing. Take poverty, for example. The income disparities in the global market economy are ever widening, leaving behind many victims of the system. Our present global crisis in food and fuel prices has affected people all across the globe. In our own country, the Government has acknowledged the need and the challenge and has instituted steps to help those who are adversely affected. Migration across national boundaries is increasingly becoming the norm in many places, including Singapore. This has brought forth more needs and new ones too, greater challenges and opportunities at our doorstep and backyard. Increasing social pathology, the needs of the younger generations and the aging population are but other issues that are crying out for prayer, reflection, and action on our part. While a number of our churches and units have already taken the initiative to deal with some of these issues, in the days to come, we as a denomination would need to give greater attention to these various issues, and in a more connectional way.